Outfield display at Las Vegas Ballpark is top 25 in size for baseball in North America! LAS VEGAS, NEV. --- Feb. 4, 2019 - The Howard Hughes Corporation®, developer of the Summerlin® master planned community, the Las Vegas Ballpark®, and owner of the Las Vegas Aviators®, the city's professional Triple-A baseball team of the Pacific Coast League and affiliate of the Oakland Athletics, announced today a partnership with Daktronics (NASDAQ-DAKT) of Brookings, South Dakota. Daktronics has designed, manufactured and recently installed a new one-of-a-kind LED video display at the Las Vegas Ballpark, featuring a unique angle to match the contour of the outfield wall. At 3,930 square feet, the new outfield display is the largest Daktronics has installed in baseball's minor leagues and is top 25 in size for baseball in North America. It features a 13HD pixel layout and measures approximately 31 feet high by 126 feet wide. The stadium's construction team - a joint venture of AECOM Hunt and PENTA Building Group - installed the new display in late 2018. 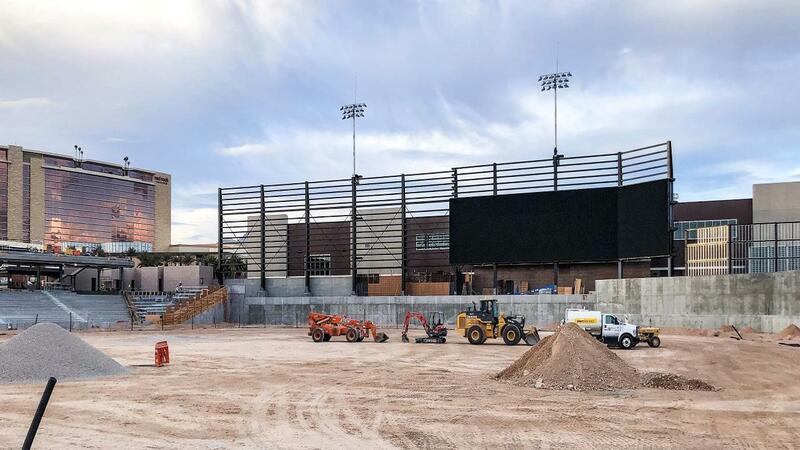 "Pairing the largest Daktronics LED video display in the minor leagues with the new Las Vegas Ballpark will blow fans away," said Rusty Lenners, Daktronics sales representative. "We're grateful to be working with The Howard Hughes Corporation, the Las Vegas Aviators and AECOM Hunt-Penta on this first-class project. This partnership has resulted in an installation that will excite and engage fans for years to come." According to Don Logan, president and chief operations officer of the Las Vegas Aviators, the new display is an exciting addition to Las Vegas Ballpark, poised to be one of the country's premier minor league stadiums. "Although the team has been in Las Vegas for 37 years, this upcoming season is the start of a new chapter for the Aviators, with a new name, a new stadium and a new affiliation," said Logan. "It doesn't get better than that." Included in this project are two ribbon displays measuring 3.5 feet high by 90 feet wide. Each features a 15HD pixel layout, providing the opportunity to display supplemental game-day information, and to highlight sponsors throughout events. In addition, a gate entry display measuring 3.5 feet high by 41 feet wide, and featuring a 13HD pixel layout, welcomes fans to the Las Vegas Ballpark with branding and promotional messages. Daktronics LED video and messaging display technology incorporates state-of-the-art environmental protection features for a long life span of consistent high quality performance and low power consumption, providing value and excitement for years to come. The Howard Hughes Corporation owns, manages and develops commercial, residential and mixed-use real estate throughout the U.S. Its award-winning assets include the country's preeminent portfolio of master planned communities, as well as operating properties and development opportunities including: The Seaport District in New York; Columbia, Maryland; The Woodlands®, The Woodlands Hills, and Bridgeland® in the Greater Houston, Texas area; Summerlin®, Las Vegas; and Ward Village® in Honolulu, Hawai'i. The Howard Hughes Corporation's portfolio is strategically positioned to meet and accelerate development based on market demand, resulting in one of the strongest real estate platforms in the country. Dedicated to innovative place making, the company is recognized for its ongoing commitment to design excellence and to the cultural life of its communities. The Howard Hughes Corporation is traded on the New York Stock Exchange as HHC. Las Vegas Ballpark, located on eight acres in Downtown Summerlin just south of City National Arena - practice facility for the Vegas Golden Knights, is the home of the Las Vegas Aviators, the city's professional Triple-A baseball team of the Pacific Coast League (PCL) and affiliate of the Oakland Athletics. Las Vegas Ballpark provides a wide range of seating options including 22 suites, club seats, berm seating, party zones and decks, picnic tables, kids' zone, bars and a pool beyond the outfield wall. Designed to create a festival-like atmosphere in Downtown Summerlin, the site is landscaped to complement the surrounding master planned community. The site is easily accessed from all regions of the valley via the 215 Beltway.